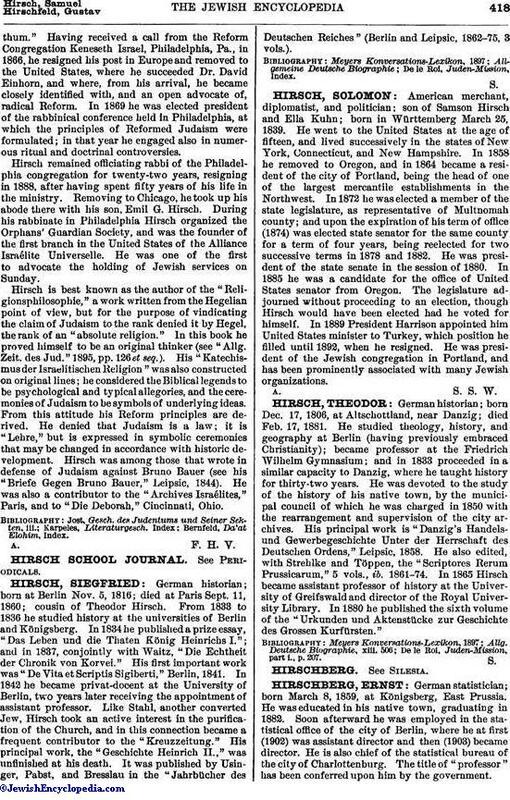 American merchant, diplomatist, and politician; son of Samson Hirsch and Ella Kuhn; born in Württemberg March 25, 1839. He went to the United States at the age of fifteen, and lived successively in the states of New York, Connecticut, and New Hampshire. In 1858 he removed to Oregon, and in 1864 became a resident of the city of Portland, being the head of one of the largest mercantile establishments in the Northwest. In 1872 he was elected a member of the state legislature, as representative of Multnomah county; and upon the expiration of his term of office (1874) was elected state senator for the same county for a term of four years, being reelected for two successive terms in 1878 and 1882. He was president of the state senate in the session of 1880. In 1885 he was a candidate for the office of United States senator from Oregon. The legislature adjourned without proceeding to an election, though Hirsch would have been elected had he voted for himself. In 1889 President Harrison appointed him United States minister to Turkey, which position he filled until 1892, when he resigned. He was president of the Jewish congregation in Portland, and has been prominently associated with many Jewish organizations.